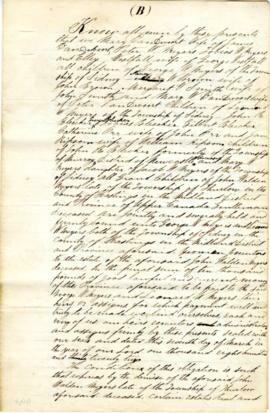 File contains a manuscript copy of the will of Captain John Walden Meyers, Thurlow Township with instructions for the division of his estate. File contains a manuscript list of heirs and statement of real estate of the late John Walden Meyers, Thurlow Township. File contains a newspaper article concerning the life of Molly Brant, sister of Thayendanegea [Joseph Brant]. Also contains a newspaper article on the Mohawk settlement of Tyendinaga and its history to 1960. Box of materials relating to the Moira Conservation Authority and O'Hara Mill, formerly owned by Lois Wishart (the donor's mother). Standing orders of Royal Canadian Sea Cadet training ship 'Trent', of Trenton, Ontario, with list of duties of the members of the organization. 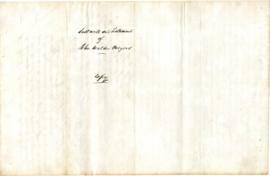 File contains two completed printed shares in The Marmora Gold and Iron Mining Company issued in 1883-1884. This file contains a book of poems and numerous newspaper clippings about the events and happening of the U. E. L. Association. United Empire Loyalists' Association of Canada. This file contains numerous newspaper clippings about the events and happening of the U. E. L. Association. This file contains a single newspaper clipping about the UEL in 1884.